Double Edge Safety Razors | 2018 Safety Single Blade Razor for SALE! Shaving with safety razors is, probably, the most popular way of shaving. Safety razors have been used by several generations of man (and women, by the way) and were a great relief when they appeared. The idea was simple enough: to allow only a very thin edge of the blade to do the work, thus preventing any possibility of making a deep cut. So on both sides of a blade were attached some kind of limiters. In a short time, it was considered more practical to avoid any process of sharpening, and blades started to be made disposable and standardized. But standard size and form of blades still allow manufacturers to vary the shape and material of the handle and the method by which the blade is kept and replaced in the holder. Usually, the blade is simply clamped between two plates made of hard plastic or metal with a screw, or by more sophisticated mechanics. When screwing (and we mean screwing) the blade is being bent a little, so that during the shave the blade’s edges should be positioned at the recommended angle to the skin. Shaving with a double edge safety razor is as simple as it could possibly be. Just keep in mind that however small part of the blade is exposed, you can still get cut with it. So your moves should be light and careful. In no case move the razor along the blade’s edges. Use a lot of soapy material and hot water. 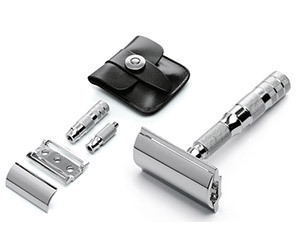 Safety razors can serve a man’s lifetime and even be given over from father to son. So safe razors allow being made items of luxury. Handles could be made of ivory or gold or whatnot and have any design. When you think of the best present to a man, consider a safety razor or safety razor shaving kit. But if you are interested in shaving itself, you could be quite satisfied with the most low-cost model. It is the same as with watches now, actually, you can have cheap Casio or good Tissot or luxurious Rolex – the choice is yours. The blades replacement won’t cost you too much. For one blade you pay from 10 to 70 cent or even less, and it will easily last you a week or more. Speaking of the razors themselves, not of the blades, we recommend you such brands as Merkur (Germany), Edwin Jagger (England), Parker (India), Muhle (Germany), Pils (Germany), Feather (Japan), Joris (France), and Weishi (China).